CityBuild were appointed to carry out the complete refurbishment of the building and to reconfigure the new building layout to meet that of the new tenant requirements. The scope of works for this project included the complete demolition of the current building layout which involved the removal of the existing roof structure, existing internal structural walls, and removal of the existing floor slab. The building which was in quite a delicate condition required underpinning in its entirety to provide for a new solid foundation for the structure. During its previous life, certain sections of the front façade had become unstable over time which was rebuilt by CityBuild. They then repointed and refurbished the façade as part of the external works to the building. Internal works to the building were carried out with the introduction of a new mezzanine floor for use as storage by the new tenant. While the structure itself was in a very delicate state, the location also made the site a challenging job – located at the entrance to a busy LUAS station and directly out onto a footpath, with no loading bay, no site office and high footfall outside the building. “Jobs like that, though much smaller in budget and physical size than what we are capable of, are in many ways more challenging than some of the larger projects such as greenfield sites, but the challenge itself is what is interesting. We’ve secured that building’s structure for generations to come – it’s something permanent that we can pass for the rest of our careers and know that we did a good job”, Cian says. It seems that challenging jobs are what CityBuild’s directors thrive on, with both taking interesting routes before they launch Citybuild three years ago. After a few years working for some of the larger construction companies, Rory cut his teeth project managing store builds, refurbishments and fit-outs all across Europe for fashion retailer Primark. “I worked both on building new stores and also the refurbishment and refitting of existing stores. For the first year that I was there I was working primarily in Ireland and the UK but as I grew into the role I moved into different regions – I worked on stores in Austria, stores in Germany, the Netherlands and Belgium”, Rory says. The role kept the elder McGuigan in and out of Ireland, sometimes spending 3 or 4 days per week out of the country, working with both Irish and European contractors. “Every project was different – some stores were stand alone, in others you might be working on a store that was in a large shopping centre or a new shopping centre development and you would have to work both with Primark but also liaise with the developer of the shopping centre. The size and scope could vary hugely too, working with budgets from €50,000 upgrade works to new developments with budgets north of €30 million”, Rory said. As well as working on stores across Europe, Rory project managed the Primark Head Office on Parnell St. in Dublin, learning how to keep an office and retail store operational while refurbishing it from top to bottom. It’s experience which he says they are utilising in CityBuild on a number of projects. “Working on the fit out for the Primark head office was challenging, as it was a full refurbishment of a five-story office block which was partially located over a retail store, and both had to remain operational throughout the refurbishment and refitting. It’s experience that has stood to us and we have had a number of projects where we’ve been able to leverage that experience for clients with CityBuild”, Rory says. Citybuild have utilized this experience for a number of larger clients, most recently on a fit out for a large multinational with an office in Galway, where constraints on time, space and noise meant that the job had to be done in half the time, while clients and tenants were still working on floors above and below the site. Cian describes it as one of the tighter schedules they have had, but one where they were able to exceed expectations on. “Originally we had an 8 week plan to fit out the building, but due to constraints on the client side we had to reduce that to just 4 weeks, with five days to complete both first and second fix on one of the phases so that 30 staff could work throughout the entire fit-out. Both the client and the landlord in question were delighted with the quality of the work and how we worked to turn it around within the constraints on the site”, Cian said. 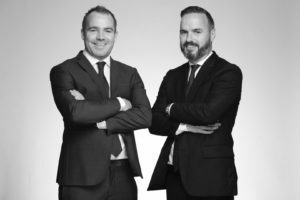 Both brothers are qualified quantity surveyors and Cian remained working on the contracting side of the sector. His first job was working on a €250 million hospital project located in Northern Ireland, he then went on to work with a large glazing contractor who exported largely to the UK. The role gave him the opportunity to track how the market in Ireland was developing before the two decided to launch CityBuild. Cian credits their success to date with constantly pushing to learn and develop more as professionals. “Every job is unique, and no matter how small it is, it’s an opportunity to learn as well as to implement the skills and experience you have already built up. You have to be forever learning – it all comes back to quality and cost and there are always new things happening in construction and you can’t ever afford to stand still, Cian says. The decision to create Citybuild was a long time in the making, but both recognised the need to bide their time if they were to create the type of professional operation they wanted to build. “Both Cian and myself always had an urge to do something for ourselves but we also recognised that until such point as we had the experience and capacity to do it, we didn’t want to do it. Over the past couple of years we were looking at the market and seeing the sort of work that we knew we could do ourselves, in many cases doing it better with the experience that we have, which is why we knew it is the right time to set up Citybuild”, Rory said. Citybuild has worked on a large range of projects over the past three years and have developed a reputation not just for quality work but for a level of professionalism that extends to all members of their extended team. “Personality is a big thing – if you have a good plan before you get on site, then it should run smoothly and with good people on site it makes a massive difference. We want to have good people who are dedicated to doing good work to a high standard, and to be able to interact with their fellow workers, the client and if needs be the public. If a client has a positive experience of the work and the people who do it, they will give you more work, it’s a simple win”, Rory says. The Citybuild directors are keen to build their business on the pillars of quality and cost and are building a large portfolio of work on the back of work they have already completed, with the projects getting incrementally larger each time. “At the moment we are mostly working on commercial and multi-unit developments. Given our experience working on very large multi-million euro projects, we’re happy to quote on projects from €50,000 to €5,000,000” Rory says. Despite the rapid growth of the business, both McGuigan’s recognise the importance of remembering how far they have come and the importance of keeping the good clients they have happy. “If we have a good client who calls us up today and asks us to sort a small works, I’ll have a couple of guys out to sort it out for them tomorrow – keeping our clients satisfied is how we generate most of our business, either through repeat business or referrals”, Rory said.